Son of King Boris III and Queen Giovanna, Simeon Saxe-Coburg Gotha was born on June 16, 1937 in Sofia, Bulgaria. Upon the sudden death of King Boris III on August 28, 1943, the 6-year old Simeon acceded to the throne as Tsar* Simeon II. A three-member Council of Regency was formed to govern Bulgaria on his behalf. Following the communist coup on September 9, 1944, Simeon II remained on the throne but the regents, including his uncle Prince Kyril, along with the core of the country’s intellectuals, were executed. In 1946, a referendum forced King Simeon II, his sister Princess Maria Luisa and the Queen Mother Giovanna to leave Bulgaria. Without abdicating, the young King was to spend long years of exile. The family settled first in Alexandria, Egypt. The choice was not accidental. The Italian King Victor Emmanuel III, the father of the Queen Mother Giovanna, lived there in exile. Simeon II was enrolled at the Victoria College in Egypt. In July 1951, the Spanish Government granted asylum to the exiled Bulgarian royal family. In Madrid, Simeon II graduated from the Lycée Français and read law and political sciences. In 1958-1959 he enrolled at the Valley Forge Military Academy and College in the United States, where he graduated as second lieutenant. In 1962 Simeon II married a Spanish aristocrat, Doña Margarita Gómez-Acebo y Cejuela. They have five children – four sons and a daughter. Simeon II Saxe-Coburg Gotha maintained broad international contacts with the business community and his manifold activities have led him to travel frequently worldwide. Throughout the years of exile he closely followed developments in his country and kept abreast of everything regarding Bulgaria. He worked actively with Bulgarian emigrants worldwide and helped many fellow countrymen. In 1996 Simeon II paid a maiden visit to Bulgaria after almost 50 years of exile. In 1998, the Constitutional Court of Bulgaria ruled to restore to his family the royal estates, which had been nationalized by the communists. On April 6, 2001 Simeon II proclaimed his decision to return for good and to contribute actively to the country’s revival, by employing the experience and contacts he had amassed in exile. In a historic address to the Bulgarian nation he proclaimed his intention to form a new political entity – the National Movement Simeon II (NMSII) – dedicated to high political morale and integrity. As the leader of the Movement, after overcoming the stumbling blocks on the way to registering the Movement in court, the Bulgarian King joined the parliamentary elections on June 17, 2001. After a landslide victory for the NMSII, Simeon II Saxe-Coburg Gotha was sworn in as Prime Minister of the Republic of Bulgaria on July 24, 2001. He completed a successful 4-year term of office in a government coalition with the Movement for Rights and Freedoms (MRF) – the first post-communist cabinet to end its mandate with enhanced public approval. During the term of the NMSII governance, Bulgaria attained the strategic national ideals of joining NATO and signing the Treaty of Accession to the European Union. 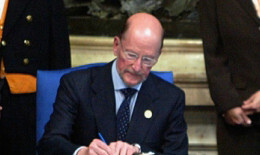 Following the 2005 parliamentary elections, Simeon II Saxe-Coburg Gotha joined the ruling Council of the tripartite coalition of BSP (Bulgarian Socialist Party), NMSII and MRF, which formed the cabinet. By a Presidential Decree of June 15, 2001, Simeon II Saxe-Coburg Gotha was awarded the highest state distinction – the Stara Planina Order First Degree – for his exceptional service to Bulgaria. Simeon II Saxe-Coburg Gotha has been decorated with more than 30 other distinctions, including the highest class of the Royal and Distinguished Spanish Order of Carlos III, the Grand Officer class of the French Legion of Honor, the Belgian Grand Cross of the Order of Leopold II, the Islamic Grand Cross of the Order of Independence of Jordan, the Greek Grand Cross of the Saviour, the Grand Cross of the Equestrian Order of the Holy Sepulchre of Jerusalem, the Grand Cross of the Order of Malta, Kinght of the Order of the Golden Fleece, Knight Grand-Cross of Honour and Devotion, as well as with the highest classes of a number of European Dynastic orders. * Tsar is the Slavic title for some monarchs. It is equivalent to that of King. Tsar is occasionally spelled csar or tzar in English.